The M18 and M12 Rapid Charge Station from Milwaukee is the fastest charging solution in the industry. With the ability to charge six packs four times faster, the station charges three batteries simultaneously while charging each pack up to 40% faster. Featuring REDLINK Intelligence, it communicates directly with the battery to monitor cell voltage, temperature, and charge status to optimize the performance and extend the life of the pack. The charge station has integrated hang holes for vertical mounting, a pass through plug to conserve outlet space, and a convenient carry handle to transport packs on and off the jobsite. The Rapid Optimum Charger offers key advantages for Makita 12V max CXT users. The exclusive built-in fan cools the battery by forcing air through the battery's air vents during the charging process for faster charging. The charger communicates with the battery's built-in chip throughout the charging process to optimize battery life by actively controlling current, voltage and temperature. The result is efficient charge times so the battery spends more time working and less time sitting on the charger. At the heart of Makita 18V LXT Series is the efficient Rapid Optimum Charger. The Rapid Optimum Charger offers key advantages for Makita 18V lithium-ion cordless tool users. The exclusive built-in fan cools the battery (sold separately) by forcing air through the battery's air vents during the charging process for faster charging. The charger communicates with the battery's built-in chip throughout the charging process to optimize battery life by actively controlling current, voltage and temperature. The result is category-leading battery charge times, which means the battery spends more time working and less time sitting on the charger. M12 and M18 12V/18V Lithium-Ion Multi-Voltage 6-Port Sequential Rapid Battery Charger (3 M12 and 3 M18 Ports) The M18 and M12 Rapid Charge Station from Milwaukee is the fastest charging solution in the industry. With the ability to charge six packs four times faster, the station charges three batteries simultaneously while charging each pack up to 40% faster. Featuring REDLINK Intelligence, it communicates directly with the battery to monitor cell voltage, temperature, and charge status to optimize the performance and extend the life of the pack. The charge station has integrated hang holes for vertical mounting, a pass through plug to conserve outlet space, and a convenient carry handle to transport packs on and off the jobsite. M12 and M18 12V/18V Lithium-Ion Multi-Voltage 6-Port Sequential Rapid Battery Charger (3 M12 and 3 M18 Ports) is rated 4.7 out of 5 by 90. Rated 5 out of 5 by dschwartzjr from So far so good. 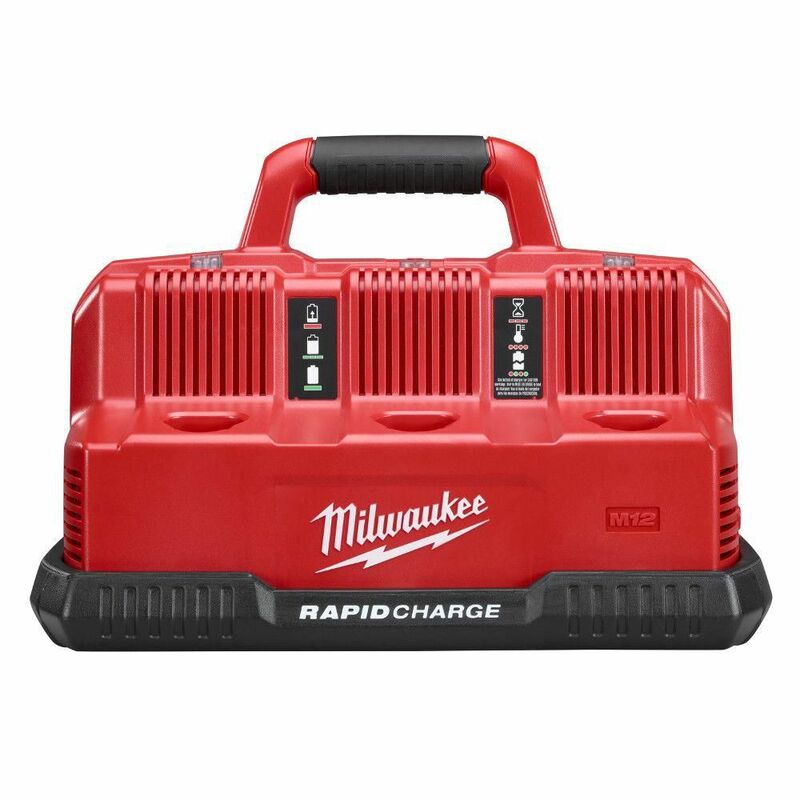 I have been using this charger for about 2 weeks now and it the fastest Milwaukee... So far so good. I have been using this charger for about 2 weeks now and it the fastest Milwaukee charger I have; only takes about 15 min for a 3.0 and 20 min for a 5.0. I have yet to put my 9.0 or 12.0 on it yet, but I feel certain it will still be quite fast. Absolutely love being able to charge 18v and 12v simultaneously! Rated 2 out of 5 by RSmall from Good while it lasted I have had this charging station for about a year and the center 18 volt station stopped working. The unit has never been abused, dropped, been wet subjected to anything else that would reasonably explain this. The other two 18 volt stations and all three 12 volt stations continue to work. Rated 5 out of 5 by Robert from It’s great.... It’s great.